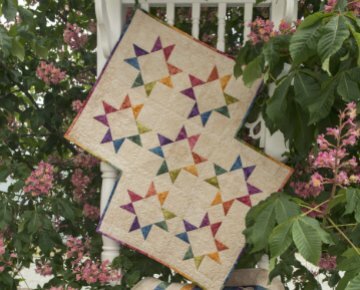 This is a great quilt using our graduated hand dyed fabrics in a more traditional block. The sample shows the Table Runner size which finishes 35" x 35". We are working on samples of the larger sizes in some other color options. This kit will come with a very soft cream background and the colors in the 8 Pack similar to Fairy Flutter. Table Runner ~ Dye-It-Bites 8 Pack plus 1 yard. Throw ~ Dye-It-Bites 8 Pack plus 5 yards. Queen ~ 8 Pack Fat Quarter Bundle plus 9 yards. King ~ Dye-It-Bites 8 Pack plus a matching 8 Pack Fat Quarter Bundle and 11 1/2 yards.